Wright referred to these free-form cutouts as stained glass for the common man. 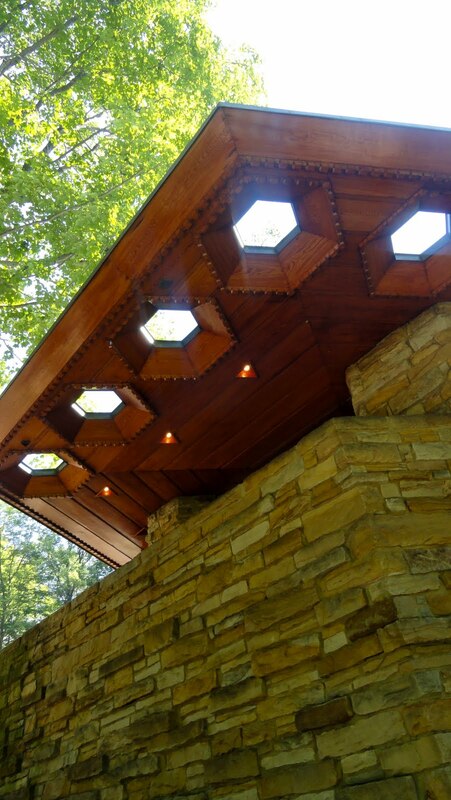 Seven miles from Fallingwater is another Frank Lloyd Wright gem, Kentuck Knob, commissioned by the I. N. Hagans, owners of the then largest dairy East of the Mississippi, and now owned by the ultimate collector, arts and architecture patron Lord Peter Palumbo. 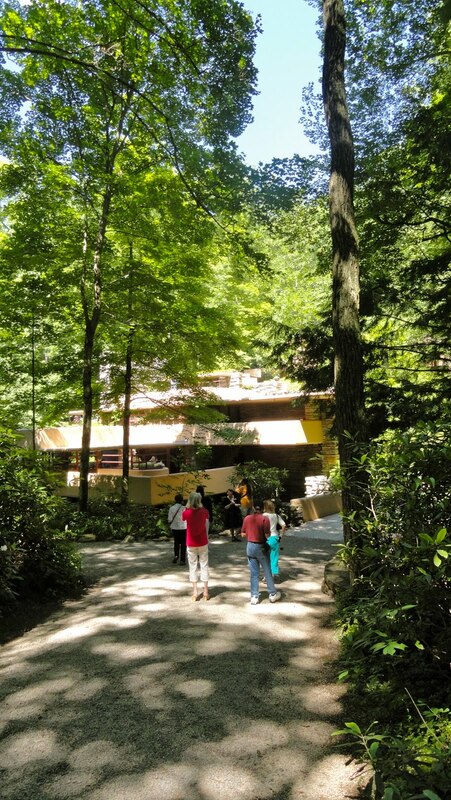 Fallingwater counts its visitors in the millions, Kentuck Knob, open to the public since 1996, in the thousands, but those who see it usually find it more livable. The difference is in the location and the clients. Triangular lights are one of the home's features. The Hagans' 80-acre tract covered a barren, logged over mountaintop that Wright never saw. They ordered a bee hive-inspired hexagonal Usonian, Wright's concept for housing the common man, with a "few" extra touches for $60,000 (Usonians began at $5,000). What began as 1,200 square feet became 2,200 square feet and $60,000 became almost $100,000. The 800 tons of stone came from the property. Tip: Don't worry about having to walk up 2,000 feet. Because there's limited parking at the home, visitors are driven up to the front door. 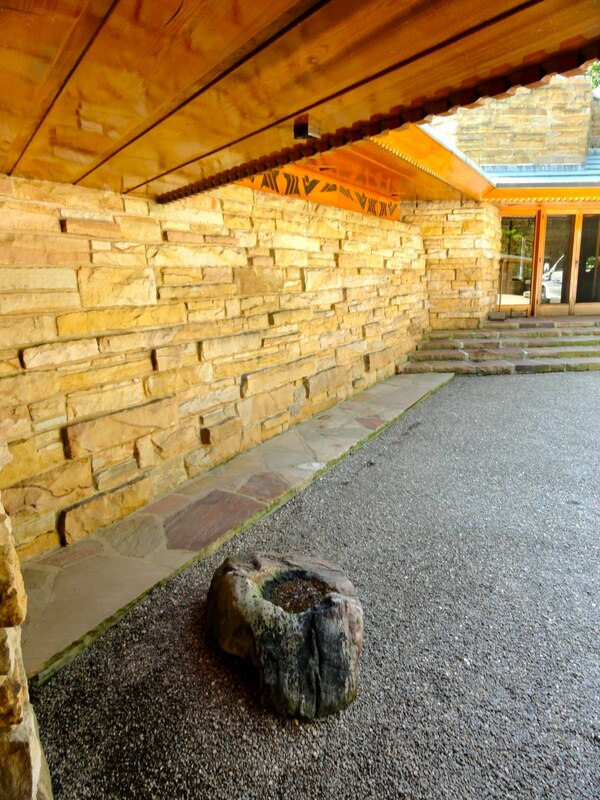 Instead of being placed on top of a waterfall, Kentuck Knob was set into the ground for as Wright said ""If you put a house on top of a mountain you lose the mountain." 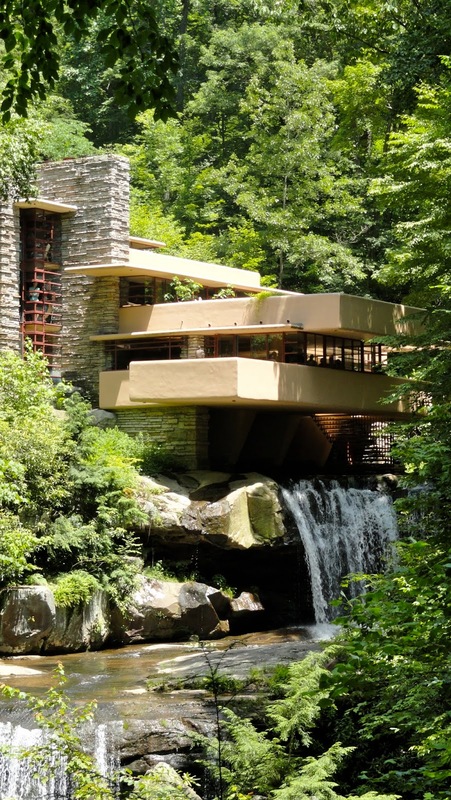 The Hagans were friends of the Kaufmanns and admirers of Fallingwater, but rather than a vacation home, they wanted one to live in year-round. The Kaufmanns had a large staff and Mrs. Kaufmann didn't cook. The Hagans did all of their own work, including cooking, so instead of an afterthought, the kitchen is a hexagonal gem. Mrs. Hagan was allowed to select the colors and appliances. Hexagonal skylight are in the house and the roof line over the deck. Their son was 6'2" tall so Wright, then 86 and working on the Guggenheim Museum in New York as well as a synagogue and 12 residential homes, compromised his usual low ceilings, raising them to 6'7". 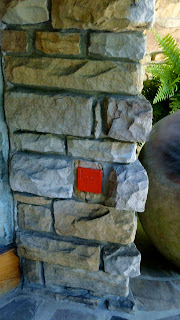 Wright eliminated unsightly drain pipes by letting water drip onto decorative boulders. Unlike the Kaufmanns, the Hagans needed storage for provisions when winter weather at the 2,000-foot altitude made the 15 miles of road to the nearest grocery store impassable. Wright relented (he hated basements) and let her have two small basement rooms for extra freezer, larder and laundry room. 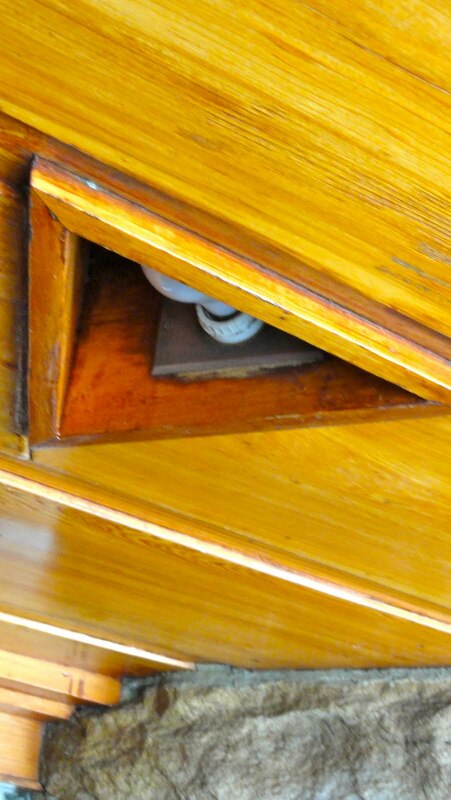 Warning: Wright may have given in to Mrs. Hagan, but he didn't make it easy for her to access the basement; the steps are precarious. Wright gave the Hagans a miniature "fallingwater" outside their bedroom. The doorways and hallways still are FLW-narrow and when the Hagans complained about it, Wright had a very good answer: "How much time do you spend in hallways? I only have so many square feet." Construction began in the early '50s and the Hagans moved in on July 29,1956. During construction 8,000 to 10,000 trees were planted on the denuded property which seemed like a good idea. Today the only view from inside the house is a tree-top one. 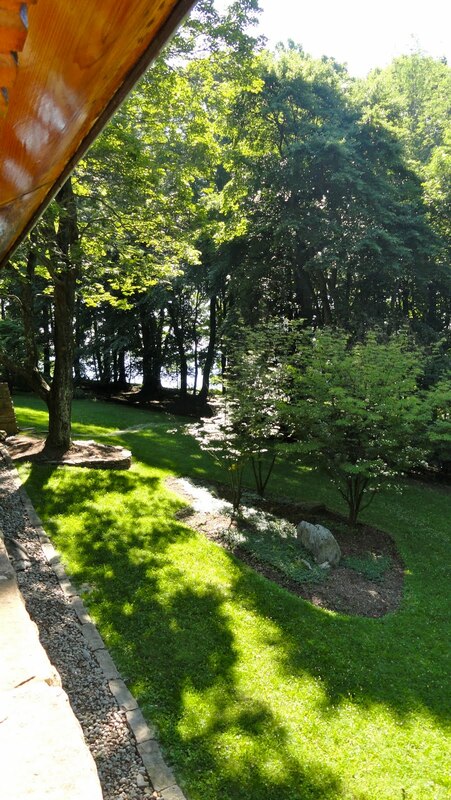 Walk out beyond the ring of trees to see the view... including Lord Palumbo's vacation home. The Hagans lived there for 30 years and planned to stay longer but when Mr. Hagan developed Alzheimer's, Mrs. Hagan put their beloved home up for sale. Lord Palumbo bought it for $600,000. A few changes have been made but Wright's integrity is untouched. Actually, with the family photographs and collectibles it looks as lived in as ever. The Palumbos built a vacation home in the valley below and continue to entertain in Kentuck Knob - after the tours. FLW invented the carport; he thought it would eliminate the clutter that accumulates in garages. Photo © by Judy Wells. 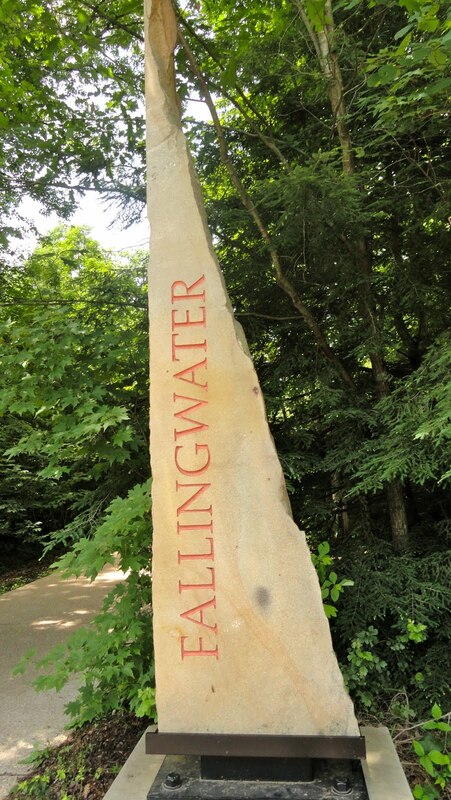 The dream not only came true but lived up to expectations when I finally saw architect Frank Lloyd Wright's iconic Fallingwater house in person. Doing so was at the top of my bucket list and a quick trip to Pennsylvania's beautiful Laurel Highlands, a few hours drive from Pittsburgh, made it possible. The home's photograph is even more well known than the famous stubborn adherence to principle ascribed to Wright, who would walk away from a commission rather than compromise (thus becoming the prototype for the hero of Ayn Rand's The Fountainhead). What you don't realize is how differently Wright envisioned the building. Most of us, including the owners, department store magnate Edgar Kaufmann and his family, would have imagined the new summer house placed to look at the waterfall. 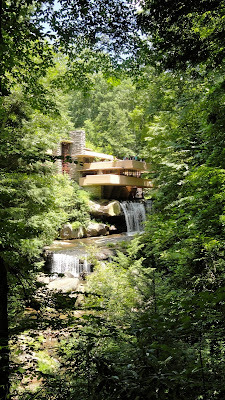 Wright put it on top of the waterfall so both family and structure become part of nature. It wasn't easy, as visitors learn from the exhibits at the visitor center and the fascinating guided tours of the house. Local laborers built the main and guest houses between 1936-39 without much input from Wright. A self-taught builder and three Wright apprentices oversaw the project. 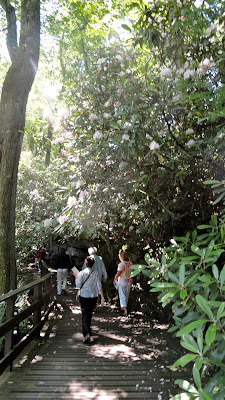 Tip: The walk from parking lot to visitor center is flat, but the walk from the center to the house is uphill. 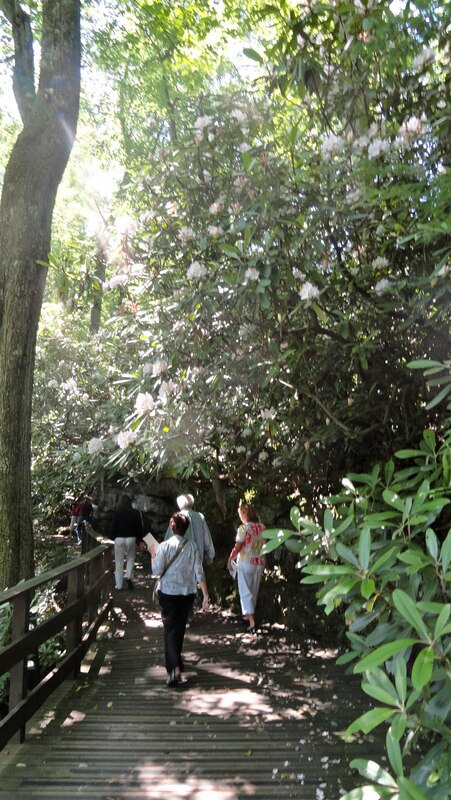 You can request a drive up in a cart, but when the rhododendrons are blooming it's a pleasant trek and sets the mood for the experience to come. In a word, idyllic. The area, once logged over to produce railroad ties, and Bear Run stream, once tainted by acid from coal mine drainage, have returned to a pristine glade of oaks, maples and hickories with understory of sassafras and witch-hazel bisected by a clear and aerated stream given the state's highest health designation. 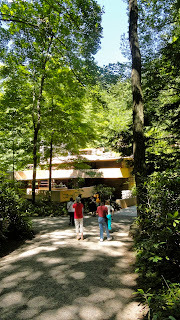 Approaching Frank Lloyd Wright's Fallingwater. 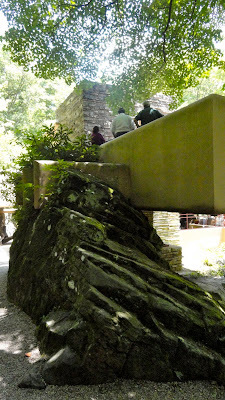 Sunlight slips through in narrow beams, Bear Run gurgles softly and you can still see the hard rock forms that inspired Wright as you walk up to the bridge over Bear Run to Fallingwater. 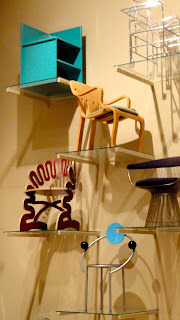 That, too, is typical Wright control; through his design and vision he dictated how you saw and lived in his buildings. 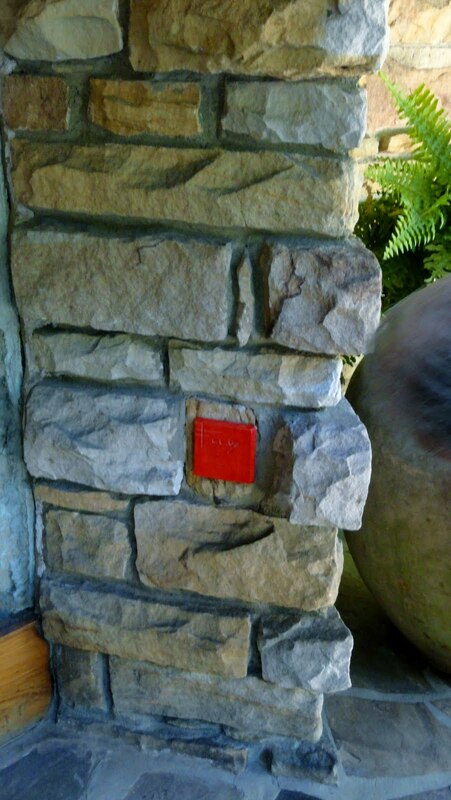 A guide meets you as you approach and warns no photos inside the house. You also won't be able to linger much as other groups are following but for most the pace is leisurely enough. Rock forms and cantilevered terrace. 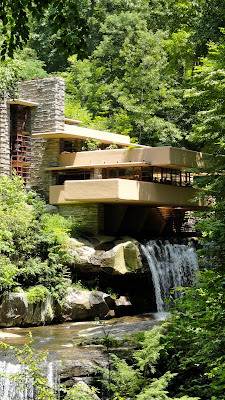 The 5,330 square-foot Fallingwater was built of steel and sandstone on three levels; open living room and its huge terrace take up the first floor, four bedroom-bath-terrace suites fill the second floor and the third floor is a separate suite for the Kaufmann's son Edgar Jr., who already was an adult when the house was built. The overall tonality is an ocher yellow, much like fallen rhododendron leaves, with touches of Wright's signature Indian red. The sound of water follows you everywhere and the compression of low ceilings forces your eyes to the windows and the outside. Tip: Given its three levels there are many steps; 14 is the most you will encounter at one time in the main house. It is not wheelchair accessible. The living room is large, its terrace twice its size and everyone loves the hatch with steps down to a small Bear Run "pool," a concession to the Kaufmanns who wanted a place to swim. There is a tiny kitchen; Mrs. Kauffmann didn't cook. 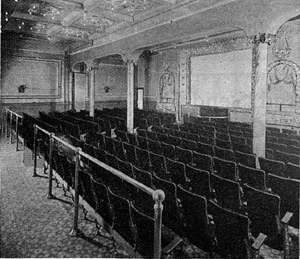 Innovations are many from media center to what is now called a great room. Architects and engineers will have a field day with the structural and design work. The rest of us won't want to leave the terraces. The Bear Run access wasn't enough for Mrs. Kauffmann, who liked to swim laps, so a large pool was added adjacent to the guest house with its two large bedroom suites and living room. Servants lived in rooms above the garage which was actually a car port, another invention of Wright who didn't believe in garages or attics because they got cluttered. Warning: There are 34 steps between the main and guest houses but there's a landing between every third or fourth step. You can't date Fallingwater to an era; it is as modern today as it was in 1939. At that time the Kaufmann's original budget for their "little mountain home" was $20-$30,000. The final cost was $155,000; Wright's commission was $8,000. In today's market a conservative replacement value is $3.5 million. 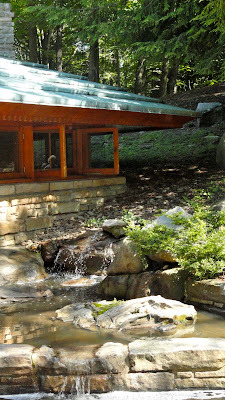 The Kauffmanns and their son used Fallingwater until 1963 when Edgar Jr. turned it over to the Western Pennsylvania Conservancy which runs and maintains it. There are many trails within the complex - the Conservancy has put together 5,000 acres - but one even Levelers should take before they leave. That's the one that goes to the ridge across Bear Run and the viewpoint from which all those famous photographs have been taken. Tip: There are 17 steps down to the bridge to get to the view point. Unless you ask for transport, you'll have to walk uphill to the visitor center, but there are benches for relaxing along the way. There are 12 steps up from ground level to center. Fallingwater from the classic viewpoint. At the center you will find a nice cafe, bathrooms and a beautiful gift shop. When you leave, however, it is Wright's unique, timeless, organic architecture and the vision of Fallingwater that will fill your thoughts. This is one must-see worth the effort. Every city has its unique quirks that set it apart but for its size, Pittsburgh may set the gold standard of quirkiness. Where else would you find natives as diverse as Andy Warhol, Fred Rogers (born in the same year! ), environmentalist Rachel Carson and pop spaceman Buck Rogers? Don't forget jazz great Billy Strayhorn, dancer Gene Kelly and America's first "pop" composer Stephen Foster. Black and gold are the city's colors thanks to the Pittsburgh Steelers, Penguins, Pirates and Pitt Panthers. 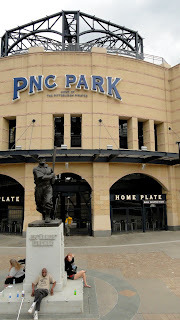 Baseball: First World Series game was played here in 1903 between the Pirates and the Boston Red Sox. Pro Hockey: First pro hockey game played at The Casino, the world's first indoor skating rink (1894). Auto Racing: Pittsburgh Vintage Grand Prix is the largest vintage race event in the country and the only one staged on city streets. Inventions: The Ferris Wheel was invented here. So was Heinz Ketchup, the Clark Bar, Klondikes, computer emoticons, Mr. Yuk, Lawrence Welk's bubble machine. The Big Mac was born nearby. 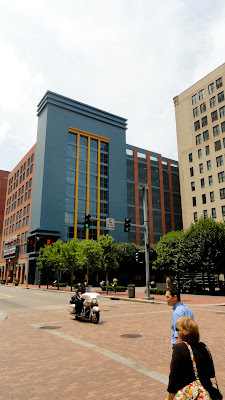 The first radio and public TV (WQED) stations aired here, first Nickelodeon movie house built (1905), NFL 's first team textile, the Terrible Towel; first and largest green convention center. The Arts: Pittsburgh has more cultural institutions per capita than any other city in America. Benedum Center is one of the busiest theater spaces in the world with 300-plus performances a year versus the typical 210. Quirky Paving? Roslyn Place maybe be the only street in the U. S. to use wood as a paving material. Household Names. In addition to those already mentioned, American Eagle Outfitters, Alcoa, PPG, U.S. Steel, Del Monte Foods, StarKist. That's just a sample of what you can see, hear and do in this popping hot city. 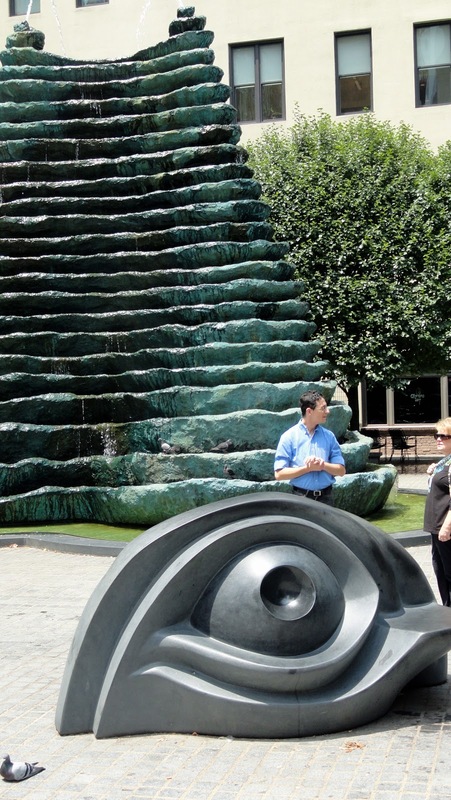 Have a seat on a rare "eyeball bench" while enjoying the fountain, all by Louise Bourgeois.. 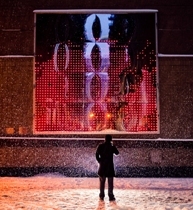 Cell Phone Disco by Informationlab. Parking garage shelters Cabaret Theater. 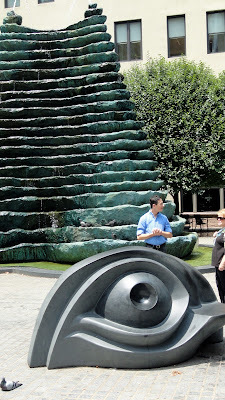 Thanks to the arts in Pittsburgh you can relax around a fountain by sitting on $50,000 eyeball benches, control a piece of outdoor wall art with your mobile phone, enjoy tulip magnolias year-'round, enjoy cabaret-style theater under a parking garage ramp and see the most innovative work in the city's oldest museum. Bronze tulip trees by Tony Chi bloom all year in an Arts District parklet. The Pittsburgh Cultural Trust for keeping it rolling into the 21st century. Another magnate, Jack Heinz, sparked the idea of turning a derelict (read "red light" district) area of downtown into an arts district, beginning with Heinz Hall, home of the Pittsburgh Symphony, and the renovation of the former Stanley Theater into the elegant Benedum Center. A 4,700-pound crystal chandelier illumines seats in the Benedum Center. The 14-block area is still morphing thanks to the Trust's part visionary, part real estate savvy approach. Thus the Doc Johnson International House of Love Potions and Marital Arts became a public art space. Galleries, studios and living spaces have followed and so have the crowds - 2 million a year, double the number 10 years ago. Tip: The theater venues are as accessible as it is possible to be in some of the city's oldest buildings. The Benedum Center elevator is at the right of the main lobby and reaches all areas. The Byham Theater elevator is at the top of the entrance lobby to the left. Goes to the lower lobby coat room and bathrooms and to the top of the balcony only. The Harris Theater has accessible seating and bathrooms on the main floor but does not have an elevator to the second floor balcony or to the basement restrooms. The O'Reilly Theater elevator is at the left of main entrance lobby and goes to all levels. The Wood Street Galleries elevator accesses all levels. SPACE, 812 Liberty Ave., hosts changing exhibits of contemporary works and installations. Sound "machines" were featured when I was there; through Sept. 4 you can watch a dozen artists painting a 10x10-foot drawing on the gallery's walls. "Every bride wants to be married here," says Merle Culley of the Carnegie Music Hall lobby. Rain of shine, but especially on a rainy day, head for the Carnegie Museum of Art and the Carnegie Museum of Natural History, two museums under one grand roof. In the days when Pittsburgh was known as "hell with a lid on," Carnegie wanted to prove the city had culture, too. Kids love the butterfly collection. He envisioned his facility as an interdisciplinary one - music, fine art, architecture, crafts, natural history, contemporary art. It still is, encompassing the history of architecture, contemporary art from the turn of the century through today, a music hall, decorative arts, industrial design (the first school for this was at Carnegie Mellon) gems, dinosaurs, even the butterfly collection that played a role in the film The Silence of the Lambs. The Carnegie International, an exposition of the finest contemporary art first staged in 1986 when the museum opened, has gone from an annual event to one every four or so years and guarantees the Carnegie's collection is as up to date as any museum's in the world. Winslow Homer's The Wreck was the first painting purchased from that original exposition. 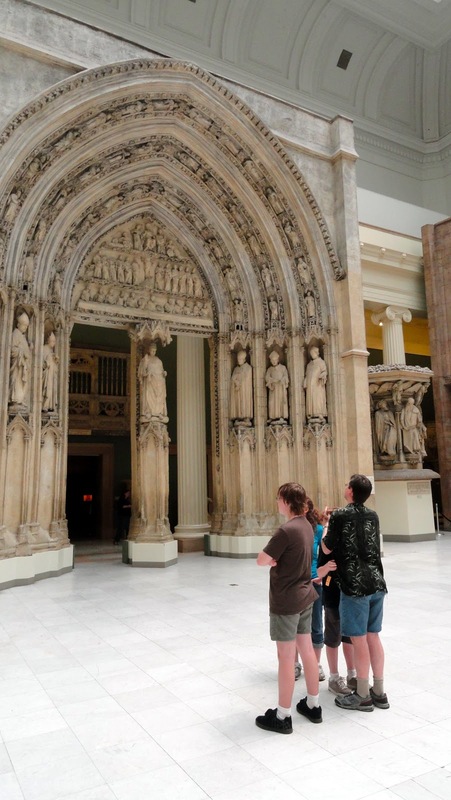 You can study the history of the world's architecture without leaving the Architectural Hall with its line-for-line plaster casts of Greek Roman, Egyptian, Romanesque and other style structures. 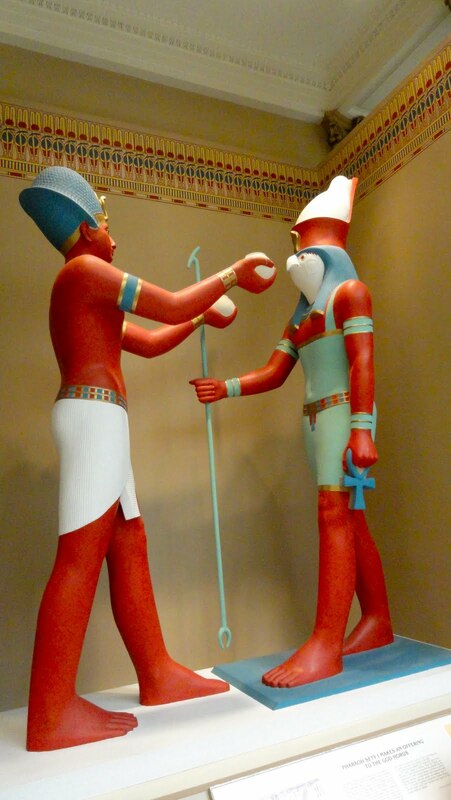 Same with statuary in the Hall of Sculpture. 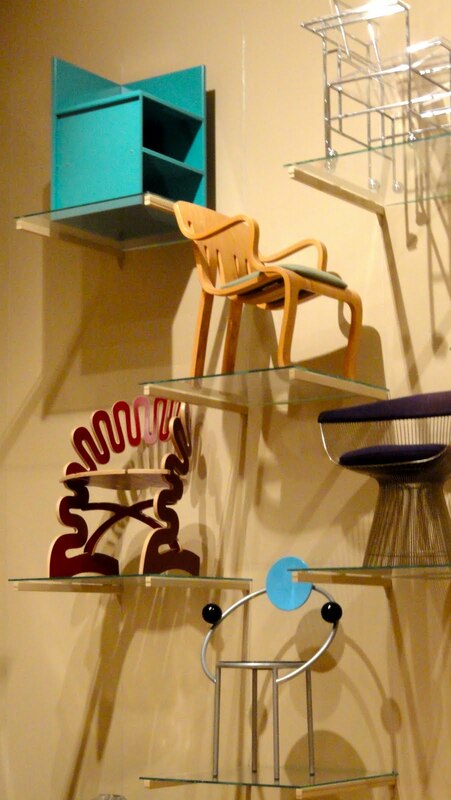 They also have one of the best collections of chairs in the country. 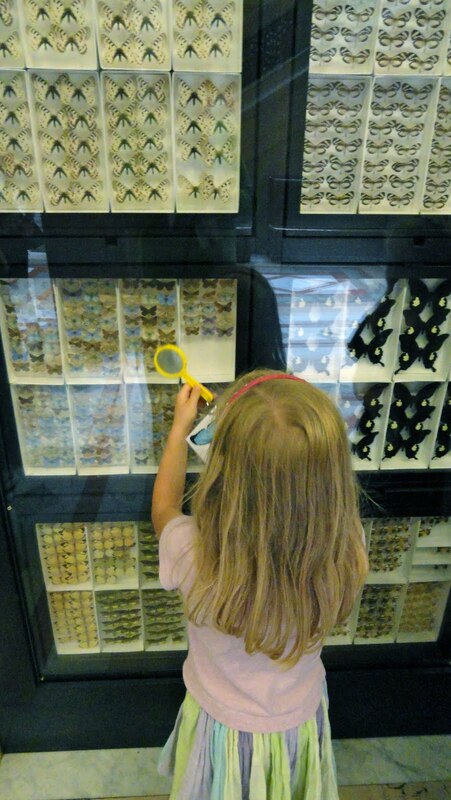 On the Natural History side, the Hall of Dinosaurs is like a magnet but do pause en route to watch through the window into the fossil preparation center and go across the hall to ooh and aah over the gem collection. Do touch the juvenile diplodocus' thigh bone, but leave the T. Rexes to the experts. Upstairs the Egyptian mummies and the royal funerary boat from the Middle Kingdom, one of only six known in the world, are faves. The gift shops looked pretty nifty too but were closed for an annual inventory. Entrance to the Egyptian Gallery. In short, this is the kind of place you can be entertained all day and still have seen a mere 10 percent of the wonders to be observed. Tip: You will have to do a substantial amount of walking but there are benches and elevators to make it tolerable. 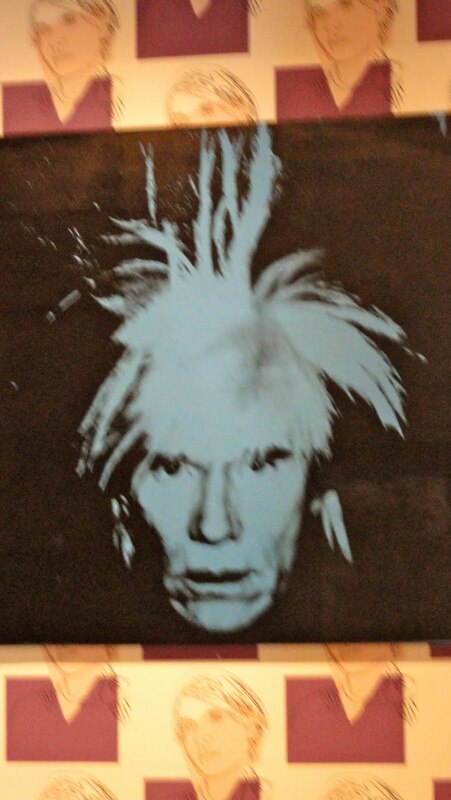 The Andy Warhol Museum is one of the city's most visited and celebrates the work and acquisitiveness of this native son for whom a bridge was named. The man collected and kept everything from his first camera to old letters and theater stubs. 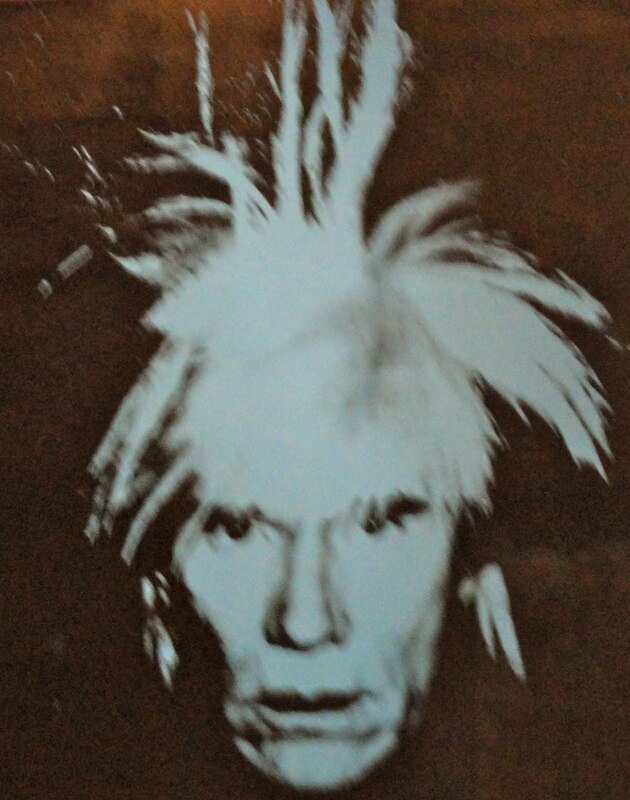 Every year the director puts together a "time capsule" of a portion, opening one more conduit into Warhol's psyche. Kids of all ages will love Warhol's "Silver Clouds" room where helium-filled silver mylar pillows are moved about with fans, an early piece of interactive art. His iconic Campbell's cans share a room with celebrity portraits (Silver Liz was done shortly after she choked on a chicken bone). 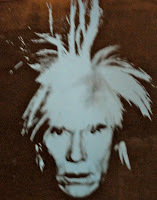 Warhol interviews artist Larry Rivers for TV. A surprise to anyone not a devotee of Manhattan's Community TV are the interview shows he created for them, not to mention the 15-minute pilot he did for MTV. This is now the only place in the world you can see them and they run continuously in a darkened room full of TVs. Tip: Many people walk the seven levels of stairs, but I'd suggest the elevator. This barely covers the bottom of the bucket full of arts venues, exhibitions and collections from traditional at The Frick to the Mattress Factory, a former mattress factory turned museum of installation art that may puzzle but rarely bore. Together, they make Pittsburgh the kind of city you can love rain or shine.